Stakeholders patiently waiting for guidance regarding the Foreign Account Tax Compliance Act (FATCA) need not wait any longer – final regulations were issued along with a press release on January 17, 2013. FATCA was enacted as part of the Hiring Incentives to Restore Employment Act (HIRE Act) on March 18, 2010 to serve as an administrative tool to prevent and detect US tax evasion and improve taxpayer compliance. As a result, chapter 4 (Sections 1471 – 1474) was added to Subtitle A of the Internal Revenue Code. Chapter 4 expands the US information reporting regime by imposing documentation, withholding and reporting requirements on payments to Foreign Financial Institutions (FFIs) and Non-Financial Foreign Entities (NFFEs). The final regulations contain over 500 pages of guidance that will undoubtedly consume a significant amount of time as stakeholders including banks, investment funds, insurance companies, and their clients, study their content. The length of these regulations is not surprising given that FATCA’s statutory provisions were intentionally broad and gave considerable discretion to the US Department of the Treasury (US Treasury) and the Internal Revenue Service (IRS) to narrow its scope when promulgating regulations. The final regulations follow last February’s release of the proposed regulations. The government received hundreds of comment letters and held meetings with different stakeholders both inside and outside the financial services industry. The issuance of the final regulations also follows the conclusion of negotiations of several intergovernmental agreements (IGAs) between the US Treasury and various foreign governments addressing FATCA implementation. This Newsalert describes at a high level some of the notable distinctions between the proposed and final regulations as well as some essential and necessary actions for stakeholders to consider. PwC will issue additional Newsalerts that will contain more detailed analyses. Please join us for a webcast providing an overview of the final regulations from 9:30 to 11:00 a.m. EST on January 29, 2013. A link to the registration site will be open on Tuesday, January 22, 2013, and can be found at www.meet.pwc.com. Do the final regulations meet expectations? The final regulations appear to utilize the basic structure of the proposed regulations and include over a hundred pages of new policy statements and rules. This added guidance addresses stakeholder and industry comments, which generally focused on cost and burdens, legal impediments, and the technical requirements. The preamble to the final regulations describes the government’s response to industry comments and affirms the government’s belief that its approach achieves a balance between fulfilling policy objectives while minimizing burdens. To achieve this balance, the government states that it focused on eliminating unnecessary burdens, simplifying processes, leveraging existing practices, and minimizing operational costs to make FATCA implementation a more manageable exercise. The preamble also references a ‘risk-based approach,’ which more closely aligns with the anti-money-laundering (AML)/know your customer risk-based approach. And, as expected, the overarching approach by the government is for the regulations to more closely coordinate IGA concepts, thereby fostering international cooperation and collaboration among governments. From an overall perspective, it appears that many stakeholder comments influenced the regulations (see below for more details). Notwithstanding the attempt to make the rules more palatable, the majority of the same fundamental obligations and requirements set forth in the proposed regulations were adopted in the final guidance. In addition, the final regulations adopt many of the same timelines set forth in Announcement 2012-42. What are some notable distinctions between the final and proposed regulations? Depository and custodial institutions. The final regulations provide clarification about the definition of depository and custodial institutions. For example, the final regulations clarify that an entity that solely accepts deposits from persons as collateral or security pursuant to a lease, a loan or a similar financing agreement is not a depository institution. Investment entities. The definition of investment entity contained in the IGAs has been incorporated into the final regulations by providing that an investment entity includes any entity that primarily conducts as a business on behalf of customers: (1) trading in an enumerated list of financial instruments; (2) individual or collective portfolio management; or (3) otherwise investing, administering or managing funds, money or certain financial assets on behalf of other persons. Accordingly, investment managers who receive fees for investment management services are considered financial institutions under the final regulations. In addition, the final regulations also provide that passive entities that are not professionally managed will generally be treated as NFFEs rather than as FFIs. Holding companies and treasury centers. The final regulations also limit the circumstances under which a holding company or treasury centre is treated as a financial institution. Deemed-compliant FFIs. While generally retaining the same deemed-compliant categories included in the proposed regulations, the final regulations introduce new categories of deemed-compliant FFIs for certain credit card issuers that permit credit balances, sponsored FFIs and limited-life debt investment entities. The final regulations also provide that regulated funds and qualified collective investment vehicles that are not regulated in their country of incorporation or organization can still qualify for the deemed-compliant status if they are regulated by the country in which they operate, or if their fund manager is regulated with respect to the investment entity. Local FFIs. Several modifications and clarifications were made in the final regulations in response to industry comments, such as clarifying the activities that would not prevent an entity from qualifying as a local FFI and expanding the type of entities that qualify for such status. Owner-documented FFIs. Owner-documented FFIs will no longer be prohibited from issuing debt interests that constitute financial accounts in excess of $50,000 to persons other than non-participating FFIs. This assumes that the owner-documented FFI reports all individuals and specified US persons that directly or indirectly hold such interests (other than persons that hold such interests through a participating FFI, registered deemed-compliant FFI, certified deemed-compliant FFI, US person, exempt beneficial owner or excepted NFFE) to the designated withholding agent. Expansion of time to review pre-existing accounts. Under the final regulations, an account is generally treated as a pre-existing account if it is outstanding on December 31, 2013. Participating FFIs and withholding agents will need to complete the due diligence for prima facie FFIs within six months (July 1, 2014), and participating FFIs must complete the due diligence for high value accounts by January 1, 2015. For all other accounts, participating FFIs and withholding agents will need to complete the due diligence by January 1, 2016. The expanded use of existing documentation. The final regulations stipulate a number of instances not provided in the proposed regulations where existing documentation can be utilized to identify a payee. For example, the final regulations permit a withholding agent to rely upon a pre-FATCA Form W-8 in lieu of obtaining an updated version of the withholding certificate in certain circumstances. Coordination of documentation for pre-existing and new accounts. The final regulations permit a participating FFI to treat a new account of a customer that has a pre-existing account as a pre-existing account provided that the participating FFI treats the new account and the pre-existing account as one account for purposes of applying AML due diligence, aggregating account balances and applying the standards of knowledge for purposes of chapter 4. Alternative documentation allowed. The withholding certificates (Forms W-8 and W-9) continue to be documents that can be used to identify account holders. However, the final regulations expand the use of alternative forms of documentation that participating FFIs may require upon opening new individual and entity accounts. Alternative documentation can be used for depository accounts as well as for certain cash value insurance or annuity contracts. Use of alternative documentation is conditioned on the documents containing sufficient information to support the payee’s FATCA status. The use of government-issued identification is also broadly permitted for identifying individuals whether issued by the government, an agency or a municipality. In another response to industry comments, the final regulations specifically point out that third-party credit agency information may be utilized for identifying an individual or entity’s FATCA status. Definition of withholdable payment. The definition of withholdable payment is largely unchanged in the final regulations, although there has been some clarification around the exclusions. In particular, a payment of US source fixed, determinable, annual, periodic income on an offshore obligation prior to 2017 is not a withholdable payment if the payor is not acting as an intermediary. The definition of foreign passthru payment remains reserved. Relief for certain grandfathered obligations. As previewed by US Treasury officials, the final regulations expand the scope of payments not subject to chapter 4 withholding by extending the cut-off date for certain grandfathered obligations by one year. Under the final regulations, obligations outstanding on January 1, 2014 will be exempt from chapter 4 withholding. A requirement to make a payment with respect to collateral posted to secure a grandfathered obligation is also exempt; however, pooled collateral will have to be allocated between grandfathered and non-grandfathered obligations. In addition, withholding agents will be given six months after the effective date of any new Section 871(m) regulations to perform the required withholding on dividend equivalent payments subject to those new rules. A similar rule applies for foreign passthru payments. The final regulations also provide clarification for how a withholding agent determines if a grandfathered obligation is materially modified. A withholding agent may, absent actual knowledge, rely on a written statement by the issuer of the obligation. Phased implementation of reporting. The final regulations modify the due date for the first information report by requiring participating FFIs to file this report with respect to the 2013 and 2014 calendar years no later than March 31, 2015. The proposed regulations provided that the due date for the first information report for the calendar year 2013 was September 30, 2014, and for calendar year 2014 was March 31, 2015.
procedural requirements for participating FFIs that are legally prohibited from reporting or withholding as required under the FFI agreement. Future guidance. The US Treasury expects to publish a future revenue procedure setting out the terms of an FFI agreement, which will be consistent with the final regulations. It is also expected to address issues related to the coordination of an FFI’s obligations under chapter 3 and the provisions of any applicable IGA. In addition, it is expected to include administrative provisions such as those related to termination, renewal and modification of the agreement. FFIs will be able to agree to comply with their obligations as participating FFIs or sponsoring entities. FFIs will be able to register as registered deemed-compliant FFIs, including Model 1 FFIs (which are registered deemed-compliant FFIs under the final regulations). The IRS will permit registration of FFIs that are described as a ‘Reporting Financial Institution’ under a Model 2 IGA so long as the associated jurisdiction is identified on an IRS published list of countries treated as having an IGA in effect even if ratification has not been completed. The IRS intends to issue a Global Intermediary Identification Number (GIIN) to FFIs whose registration is approved. GIINs will be assigned no later than October 15, 2013. An FFI will use its GIIN for satisfying its reporting obligations and to identify its status to withholding agents. The IRS will electronically post the first list of participating FFIs and registered deemed-compliant FFIs (including Model 1 FFIs) on December 2, 2013 and intends to update this list monthly. An FFI must register with the IRS by October 25, 2013 in order to be included on the December 2013 list. New certification of compliance. Under the final regulations, a responsible officer of a participating FFI is required to periodically certify to the IRS that the FFI is in compliance with the requirements of the FFI agreement. This certification is required once every three years. In addition, the responsible officer is required to certify to the IRS that it maintains effective internal controls and that there were no material failures during the certification period, or that any material failures that did occur were corrected. Time and manner of making certifications. The final regulations provide that responsible officer due diligence certifications will be made electronically through the Portal no later than 60 days following the date that is two years after the effective date of the FFI agreement. Qualified certification. The final regulations clarify a responsible officer’s responsibility when he or she is unable to make the required certifications. The final regulations provide that a responsible officer may make a qualified certification stating why the general certification cannot be made and that corrective actions will be taken by the responsible officer. 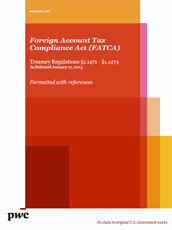 FATCA remains one of the most ambitious, comprehensive and complex information reporting regimes in the world. The final regulations provide many of the needed details and clarifications regarding customer on-boarding, customer due diligence, account opening, documentation, registration as well as tax reporting and withholding. The US Treasury and IRS have outlined and appear to have followed a policy approach using the guideposts of a risk-based approach, collaborations with non-US governments as well as simplification. With that in mind, favourable changes have been made, for example, to increase the time available for reviewing existing accounts, expand the use of existing documentation and defer the application of FATCA for certain existing obligations. So what is the effect on your company? Stakeholders and their clients will need to take some time to fully comprehend the impact of the over 500 pages of policy statements and rules in the final regulations. The story is still unfolding especially with the level of cooperation and implementation details from foreign governments that are expected to implement IGAs. The next step is that planning and solutions put in place based on the proposed regulations should be reviewed and updated in line with the new final rules. Plans to modify or replace operational processes and information technology systems will also need updating. As part of this effort, companies should also broadly quantify their compliance costs considering the simplifications within the new regulations. Do the simplifications substantially improve the bottom line compliance costs? How may the new regulations mitigate an expected drain on resources? The EU FTT: a “non-starter” or “just an issue of how”? EU FTT – Will the Commission’s proposal survive?